There are many cities in the world that are quite happy with just the one airport. Berlin is not one of them as it looks to open its THIRD airport later this year or early next. The German capital currently has just two airports after the closure of small Tempelhof airport in 2008. The two airports in operation at the moment are Schönefeld in East Berlin and Tegel in West Berlin. These airports are both very close to the city, with Tegel almost in the city centre itself! Schönefeld is a little further out of the capital, but still close enough to reach the city in almost no time at all. Tegel is the busier of Berlin’s current airports and has been around since pre-war times, though not as a commercial airport until the late 1950s. It is located in the western part of the city, just five miles away from Brandenburg Gate right in the city’s centre. It is the main airport for European and domestic flights and carried an average of over 15 million passengers a year over recent years. Schönefeld is Berlin’s other airport. It caters more so for budget airlines and is located a little bit further outside of the city. Many a cheap holiday has been had via Schönefeld, however, and after a cheap flight an affordable accommodation option can make a Berlin holiday very cheap indeed. The area around Schönefeld is set to get a lot busier in the near future as Berlin’s brand new Brandenburg Airport is currently being built just a little bit south of Schönefeld. 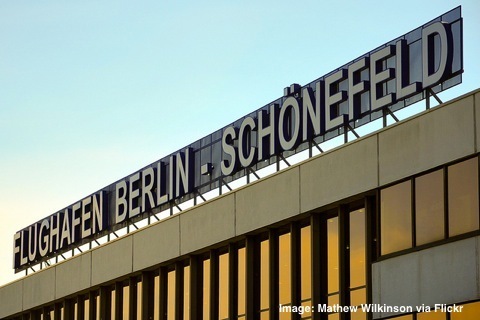 Schönefeld Aiport will be kept open and eventually become part of the city’s third airport, but Tegel on the other hand will be shut down when Brandenburg opens. Brandenburg Airport is still being built – and that’s a problem considering it was due to be opened in 2010! The opening date has been moved four times now and there is currently no official opening date, although 2014 – or later – is the current expectation. The delay hasn’t gone without German scrutiny of course! Many people say that the delays will do and may have already done a lot of damage to Germany’s reputation for engineering reliability and excellence. The CEO of the airport has already been fired and there has been a major managerial reshuffle. Berliners hope that this will kick-start the last stage of work and that they will finally see Brandenburg opened and ready for action! Tourists too will be hoping for the works to be completed quickly. Schönefeld and Tegel have themselves been left in the dark somewhat, with no significant improvements given that their importance will not last for long. When Brandenburg Airport does finally open up, visitors to the city can look forward to a state-of-the-art airport, just half an hour away from the city. So Berlin may only have three operational airports for a short period of time, between the opening of Brandenburg and the closing of Tegel, but that’s still unusual for most cities in the world.